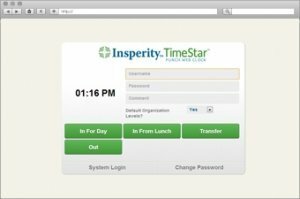 Gather time data for your employees from almost any computer. 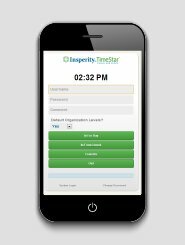 Collect remote workers’ hours easily using mobile and telephony technology. Take timekeeping accuracy and security to a new level. No need to invest in additional hardware, maintain a badge system, or deal with administrative costs. Employees can enter time anywhere they have access to a web browser and internet connection. Enable remote employees to use browser-enabled smartphones and tablets to clock time from any location. Using a touchtone phone, employees can enter their time using the keypad. Learn more about these extensive time tracking solutions. 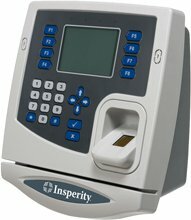 Insperity® Access™ Time Clock features a 10-inch color touchscreen with intuitive user interface, and it arrives ready to track and approve time cards. With it employees can view their scheduling history including accrual time, org level, hours by pay type, time off, etc. It also has bells to signal shift changes, lunches, or breaks. Delivers UPS battery backup, six USB ports for peripherals, and a resistive touch screen that avoids false triggering. Use self service and familiar touchscreen functionality to navigate menus and to access and review information. Address issues that arise with the help of Insperity’s support team who connect directly to the clock and troubleshoot from their location. Plug in and go, that’s it. Insperity does all the programming and setup on the backend. Use the POE option, powering clocks over Ethernet when outlets are unavailable. Choose from Key Pin Entry, Barcode or Proximity Reader, Magnetic Strip Reader, or Finger Print Biometric. Support sustainable practices: Insperity® Access™ Time Clocks are made of recyclable, polycarbonate composite and use a mercury-free, LED backlit screen. Avoid delays in transferring punches to the software with Service Management Layer (SML) that automatically sends clock data to time and attendance, communicating through firewalls if necessary. Insperity, a trusted advisor to America’s best businesses for more than 27 years, provides an array of human resources and business solutions designed to help improve business performance.